This is the Terra Incognita Espresso Blend brought to you by Portola Coffee Roasters. 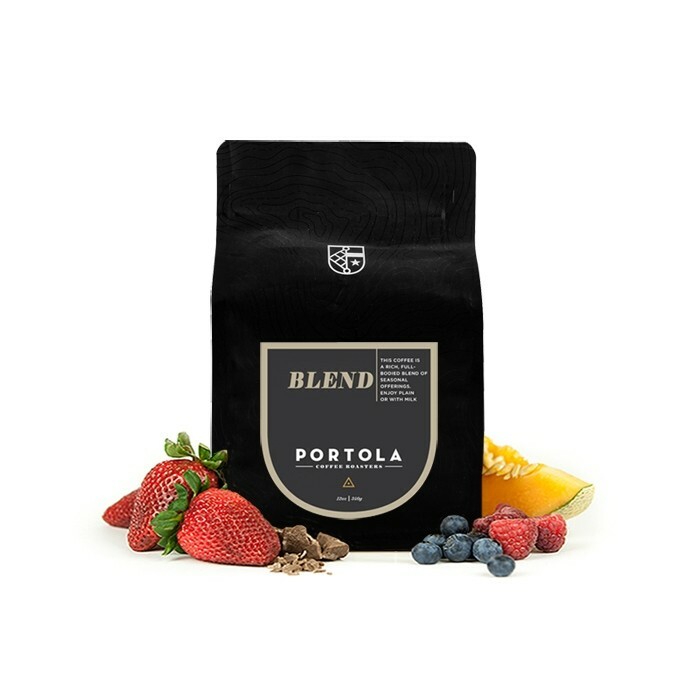 Portola sources fresh coffee throughout the year, which means as their seasonal coffee line-up changes, so must their espresso blend. This iteration is a blend of a natural coffee from Ethiopia and a washed coffee from Colombia grown between 1,700 and 2,100 meters. This cup is complex with floral aromatics, red fruit and dried stone fruit in the high notes and chocolate and caramel lingering in the finish. Unbelievably sweet, with a nice jamminess when we need it and a good chocolate backbone. I enjoyed this espresso. Full flavor served as a gibraltar. Slightly sweet, but not overt. Would buy it again. A robust espresso with complexity and depth. A hint of smoke without the bitterness. Better than the last one! This was smooth and kept its rich flavor in all the sip. Well balanced. No too robust nor too light. Overall, this was a great blend. But what else could I expect from my two favorite regions mixed together. This one was perfect. Dark chocolate, caramel, some fruit and floral notes. I would get this one again. Best tasting coffee yet. Love the smell, the taste and flavors. For me this one is 'just right'. Delicious flavor. A tad lighter / fruitier than the average espresso blend. Medium body. Really great coffee. Love the richness and the nose of the beans. Easily my favorite coffee from Mistobox! Chocolate and bitter due to a darker roast but not too bitter. Enjoyed it. Excellent all around coffee, and makes a great espresso. Favorite so far! I could drink this every day. Love the smoothness. Very nice espresso blend, the coffee is balanced with subtle fruit/flower hints. it is a darker roast without tasting burnt, acidic, or like the essential oils were roasted off. This is so good. Smooth. Sweet. Aromatic. A very nice coffee. Notes of chocolate and earth. Well-balanced and drinkable. Just not to my liking. It's that medium roast thing. Lovely, balanced blend with floral hints—possibly even fruity. Very aromatic, I enjoyed it. This one is really enjoyable. This was a really nice espresso. A bit shifty at times, but when it was pulling in the zone it gave me everything I could ask for. Grind took me a bit to dial in. I liked this one better about 12 days off. Lighter roast tha usual for espresso makes the cup much more flavorful, and less dark than most. Fruit tones come through clean leaning towards stone fruits, cherry. Excellent espresso. Huge improvement over the last batch. A nice medium roast that pours beautifully. The Ethiopian notes come through loud and clear; floral with a bit of blueberry, nicely balanced acidity. Liked this one too... Smelled and tasted just delicious!